Showcasing the rich cultural heritage of Ladakh, Ladakh festival brought people from different parts of the world to experience the tradition and culture of the region from September 22 to 25. A four-day cultural extravaganza was organised by J&K Tourism department and LAHDC, Leh with an aim to promote the rich culture and heritage of Ladakh and tourism. Around 20 cultural troupes from different parts of the region dressed in their traditional attire and five groups of school children participated in the cultural procession. Rigzin Samphel, Secretary, J&K Tourism, chief guest welcomed the visitors to Ladakh. He said that the simplicity, hospitality and warm nature of the people of Ladakh have definitely won the hearts of visitors who came from different parts of the world to explore Ladakh. He expressed his gratitude and hope that in the future they will visit Ladakh not just as a tourist but more like a friend. He further appreciated the coordinated efforts of all the tourism sector stakeholders for developing and promoting tourism along with culture and tradition without any conflict. Scintillating traditional dance and song from various part of Ladakh region including, Nubra, Changthang, Sham, Dha-Hanu, Gya were showcased. Avny Lavasa, DC, Leh said, “The influx of tourist visiting Ladakh is growing every year and it becomes crucial to focus on responsible tourism to maintain harmony with the traditional ecological practices for sustainability”. Talking about the potential of adventure, wildlife, culture and pilgrimage tourism in Ladakh, she urged the locals and tourist to understand the responsibility and protect the fragile ecology. 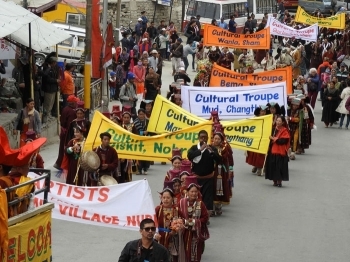 The festival provides an opportunity to explore and witness the different traditional dance and songs, traditional sports like archery and polo, handicrafts, local cuisine, mask dance, photo exhibition on birds and mammals of Ladakh, demonstration of contemporary sculpture and many more.